Am I a psycho for considering this? Well, it's not actually me, my father is considering it. Right now, he's driving a 997.1 S Cabrio for the summer, and a Cayenne S that was my mothers until she took delivery of the AMG wagon last month. The cayenne is pretty standard looking, and is a phenomenal car other than the colors and 18" wheels. The 997 was a bit of a placeholder car when his E92 M3 met its fate this past summer, so he's considered getting either a 991 4S or 997.2 4S, but he's grown fond of having a bigger car in the winter so after thinking he's thought of keeping the 997.1 and getting another E63 AMG 4Matic wagon, albeit with better looking (read: manly) color choices. 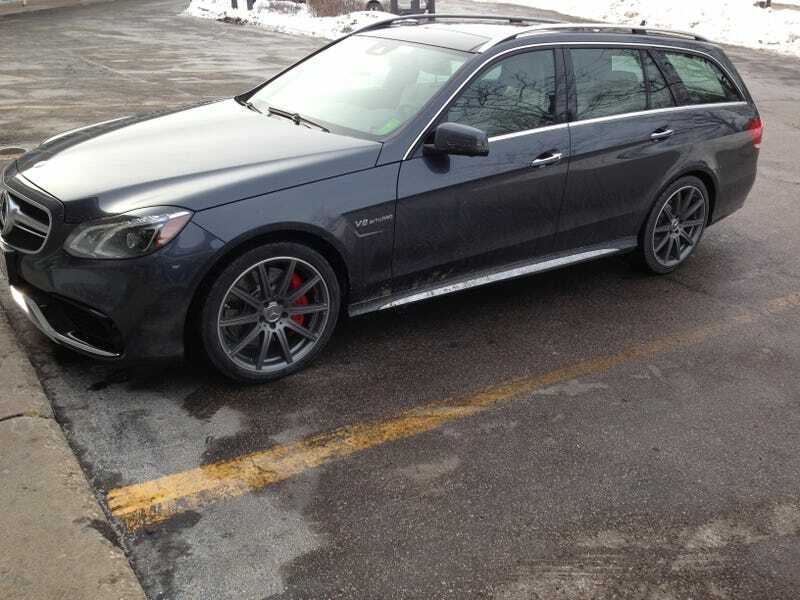 The E63 is just so much fun to drive.... mind bending speed and it sounds like the god of thunder rolling around the city. Gimme your thoughts oppo. Enjoy a pic of the current AMG for your consideration.